I never got around to thanking Elaine for teaching me to drive. At 16, getting my license was my passport to freedom [and the end of hitch-hiking]. I took my permit test on my 16th birthday and immediately scheduled my road test for a few weeks later. Unfortunately, I almost clipped a woman at a cross-walk and earned an immediate failure. I think it was the last time I ever drove a car without power steering. So, it was back to the drawing board – and another three weeks or so of waiting for my second shot. That’s where Elaine comes in. Elaine started working for my dad when she was just a kid. My first recollection of her is at the ticket gate at the Twin Drive-In Theater. It was in the late 50’s, and my father had opened up a new drive-in with two screens. My Uncle Lou and my dad had a thing for drive-in theaters. In 1952, they built the Transit Drive-In themselves out in the middle of nowhere. How the screen they cobbled together stayed up, no one will ever know, but it did, and it was the start of a fascinating run of new businesses that started with the Twin Drive-In to Twin Fair to Value Home Improvement Centers. From 1950 to 1970, they created some of the most memorable businesses in WNY. They were a hell of a team. My Uncle Lou took the edge off my dad, and they flourished together for 30 years until my Uncle Lou’s untimely death in the early 70’s. My father was never the same. I started out writing this post about Elaine, my father’s Girl Friday, but it really got me thinking about my father as a merchant. My father was caught up in the discount-store-mania that was starting to sweep the country in the early 50’s [along with drive-ins, miniature golf, and rock’n’roll]. I remember Two Guys out of New Jersey was the first big competitor [along with IDS and eventually Big N]. WalMart, at the time, was a little late to the game [they didn’t get started until 1962], and no one gave them much attention. My Uncle Lou and my father started Twin Fair by piecing together a series of relationships starting with John Nasca and John Bona. My father leased out several of the departments, and that allowed him to get the requisite financing from M&T Bank. Jim Otti [sp?] was a Commercial Loan Officer at M&T back in the day, and he was the only one who would even talk to my father about his novel idea. Marine Midland wanted nothing to do with Italians, and if it wasn’t for Jim, there would have been no Twin Fair or Valu Home Improvement Centers. I still bank with M&T for that very reason. My father was an extraordinary merchant. Although he never put his name on his businesses, and never accepted any accolades or attention – he was the man that built both Twin Fair and Valu Home Improvement Centers. Tony Ragusa is not a name that is remembered by many in WNY, but his businesses are – and that’s all he ever wanted to build. Along for nearly all of this was Elaine. As I said, she became my father’s Girl Friday. In the days of secretaries, Elaine transcended the role to become an essential element in the controlled chaos that is a merchant’s life. 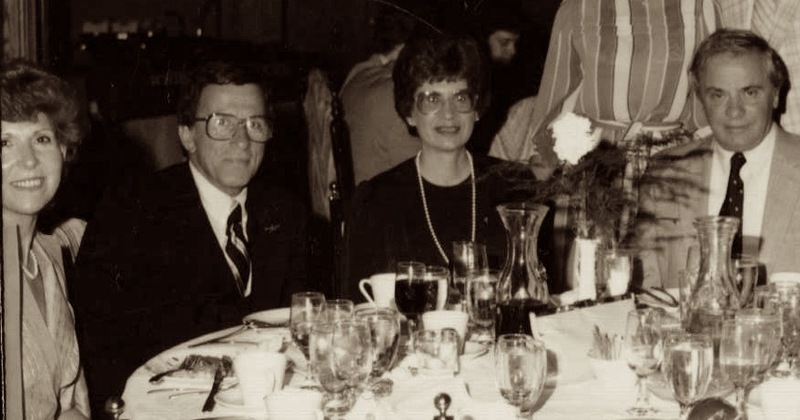 My father was a widower for nearly 9 years before he eventually married his right arm, Elaine; and they spent the next 30+ years together through thick and thin. And, yes, I finally got my license, and it was Elaine who patiently taught me to parallel park. This a picture that I carry in my journal [and will forever]. It’s Theresa Manzella [who was like a second mother to me and my favorite woman of all time], Doc Manzella, Elaine, and my father. My grandfather bought the Transit Drive-In from your family back in 1957. 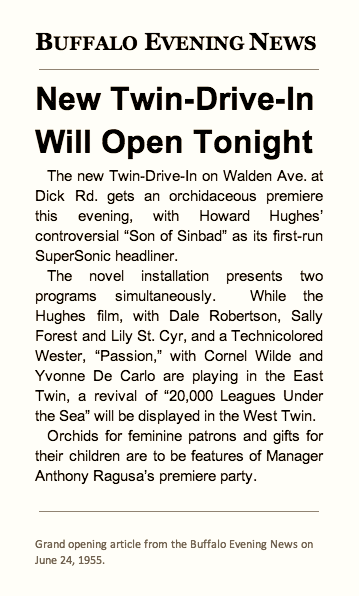 The story I’ve heard is that Tony and Lou wanted to focus on their Twin Fair business, and felt the drive-in business had already peaked. We’d love to frame and display any photos or memorabilia you might have from the Twin Drive-In or the Transit Drive-In inside our lobby. Hi-resolution copies will do just as well as originals, if you don’t want to part with anything. I believe your family was also involved with operating the Lockport Drive-In located on Rte 31 in Gasport, and the Boulevard Drive-In located on NF Blvd in Wheatfield. The Twin was the very first multi-screen drive-in built in this area. Loved Twin Fair as a child! My sister thought it was an actual fair!! !